A San Francisco woman says she has been reunited with her engagement and wedding rings she lost last week thanks to a United Airlines gate agent and pilot. Brit Morin posted a tweet Monday saying a pilot hand delivered the rings back to her in San Francisco. A United gate agent found the jewelry and gave it to the pilot, Morin said. "I have a newfound faith in humanity and airlines," Morin said in her tweet. 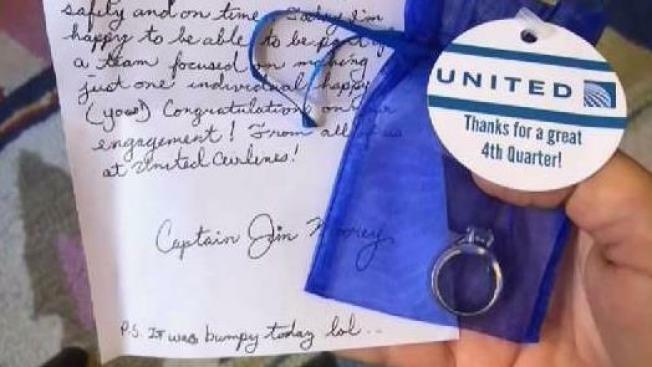 Morin's tweet included a photo of a ring, along with a written note signed by the pilot. She also said in the tweet the rings were lost somewhere between New York and Jackson Hole, Wyoming. A tweet from United replying to Morin indicates the airlines plans to recognize the pilot and gate agent for their efforts in helping return her ring.